In the past 48 hours, I have found myself thinking, “My ex would be so proud of me.” A lot. But the truth is, I’m so proud of me. I’ve been doing a lot of the things he used to do. And doing them well. Or well enough. Most of them, weather related. I grew up in Michigan and lived there until I was 24 years old. So by rights, I shouldn’t be phased by snow. But I am. Especially driving in it. Living in California for 14 years meant I didn’t have to concern myself with it. Except in the mountains, and only then when there was accumulation. Climbing the winding roads to Bear Valley, I would pull to the side when we hit the snow line in Arnold, and without a word, hand over the keys. Without even asking. It was just understood. When we moved to Chicago in 2007, it was similarly understood that he would drive when the roads were dubious. That he would dig the car out, if necessary, and carve out a parking space on the street — “holding it” with random household items that would not blow away. This is no longer an option. I realized this on Tuesday afternoon, New Year’s Eve, as I watched big, fluffy flakes come down in sheets, sideways. I had made a commitment for the early evening and invited a friend to join me. It was her first New Year’s Eve single again, and without her children. And so, with no one to hand the keys to, and a strong desire to make good on my word, I got behind the wheel. The side streets were a mess. The main roads weren’t much better. Snow was falling faster than the plows could pick it up. And it seemed there were precious few out on the roads. As my friend Chris often advises, about most everything, I “took it slow.” Like most everyone else on the road. I didn’t hold the wheel with a death grip. I didn’t take silly risks either. I met my obligations, but also made it an earlier night than originally planned. Feeling bolstered by the experience, and also frustrated by letting the weather dictate my social calendar, I drove to the South Side on Wednesday for a New Year’s Day party – filling the hours with good friends and good conversation, and my belly with black-eyed peas and seven greens, for health and good luck, as is the tradition in the south. Driving home I could feel the snow rising under my car. Gliding on top of it. It felt scary and kind of fun at the same time. And I was both pleased and relieved when I parked the car for the night. Luck ran out this morning when the Honda couldn’t quite make it over the inches of fluffy powder that had accumulated around it, and that continued to. I sort of expected this and took the train to work. 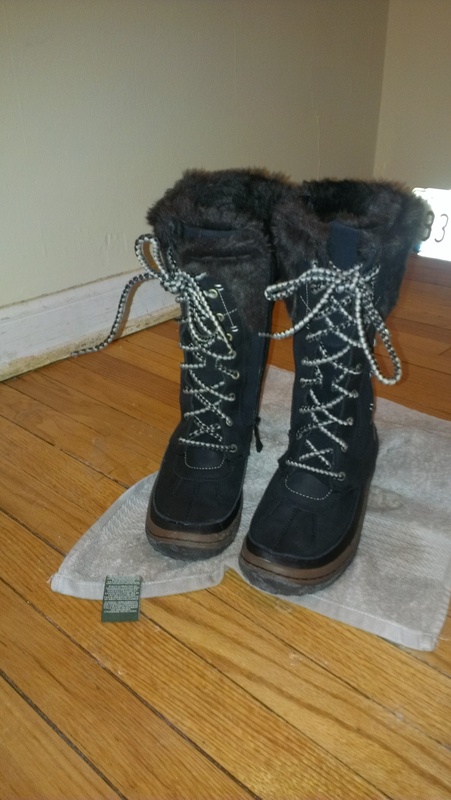 On the way home, I bought myself a spendy new pair of winter boots, as the ones I was wearing had begun to leak. After dinner, I went back outside. Started the engine, brushed the snow off the car and shoveled a pathway out from the white swath that neatly tucked it in. I knew I had to before it froze overnight and I was stuck until spring’s thaw. I know this all seems terribly basic. But the truth is, I haven’t done it in more than 20 years. Since I left Detroit. And there, I depended on my father to crowbar open the occasionally frozen-shut door. Or I skipped work entirely if the roads seemed questionable. My foray into shoveling and driving in inclement weather doesn’t go quite that far. Nor would I want it to. I’m ok with asking for help. And I’m grateful for the people who do for me what I truly cannot do for myself. It’s more like the postcard I have stuck on my white board. 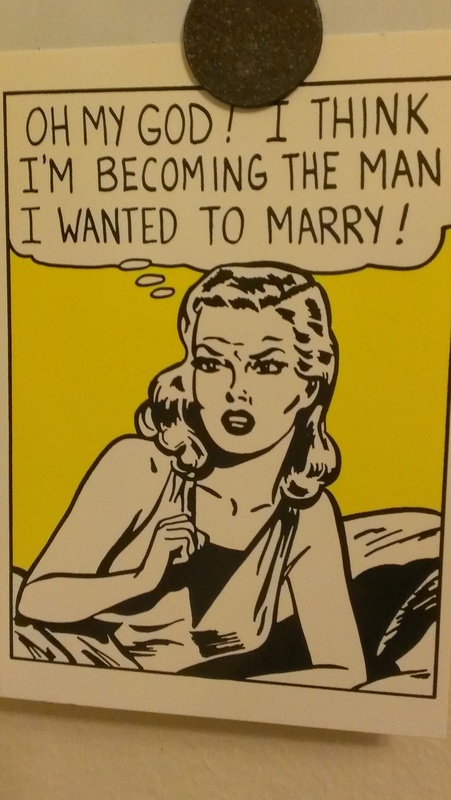 A Lichtenstein-style cartoon of a woman, her word bubble reading, “Oh my God! I think I’m becoming the man I wanted to marry. It’s true. I have. And not just when it comes to snow and cars.